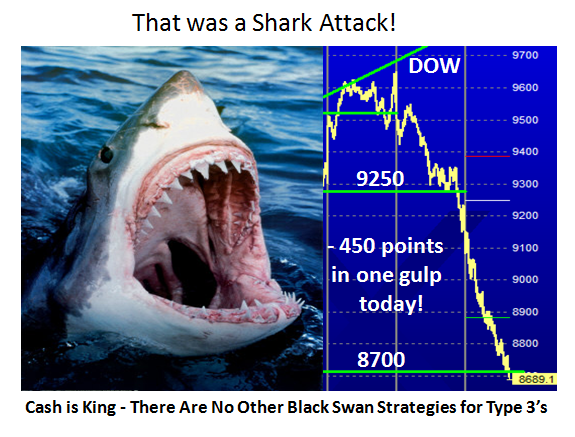 Ian Woodward's Investing Blog » This Stock Market has the Jitters! « Stock Market – Is there a Chance of a Bear Market Rally? This Stock Market has the Jitters! The picture speaks for itself and this game plan is solid as to where the fight at the OK Corral is at. At this stage of the Game, the only thing for Type 3 and 4 Investors is to sit in cash and be thankful for small mercies as this is too treacherous a market for one to throw your hard earned money at. As I have said before Types 1 & 2 are enjoying the volatility and when one can make 15% in a day on the FXP and 8% on the QID, that is money for jam. Now we have the birth of triple ETF’s so those of you who are high rollers can enjoy to your heart’s content if you have the stomach for it. It seems we caught the proper mood at the seminar, and we will just have to wait and see if we can climb out of this mess. Recall the overlay charts I cobbled up to show you what a double and triple bottom could look like and you will realize that we are faced with six months to a year of ebb and flow before we can even begin to think of a decent recovery. Today’s action has broken down the attempted rally which has fizzled into a Broken Bounce Play. As I show in the diagram, all the good work of the previous week which I covered in the last blog has been wiped out and that congestion we see between 9000 and 9250 now becomes stiff overhead supply. We have to start all over again with Capitulation, Reversal Day, Follow Through Days, Eureka and Kahuna signals to the upside before we even get a glimpse of a new beginning. At least we can say that we now understand the Bango Process, and you are the richer for having taken the time and expense to learn what to look for. Now that “the buy the rumor sell the news” phase on the Election is behind us, the Market remains uncertain and that is what is causing the jitters. It will not rest easy until the incoming administration identifies two key positions, Treasury Secretary and the Fed Chairman, and then watch out either way depending on whether the Market likes the selections or not. Of course those are not the only concerns but in any event it seems obvious that this bottoming action will be a long drawn out affair and at this stage of the game, the odds favor the Bears. After all the yardstick suggests we are but two days away from breaching the bottom. Five percent days up and down have become commonplace, whereas a month ago we were marveling at it. Warren Buffet can afford to throw a few million here and a few there and a few more out the window and not flinch, but he must know something that you and I don’t know. My suggestion is to let the market tell you what to do based on proven Stakes in the Ground and Measuring Rods, unless you are a soothsayer or have deep pockets like him. 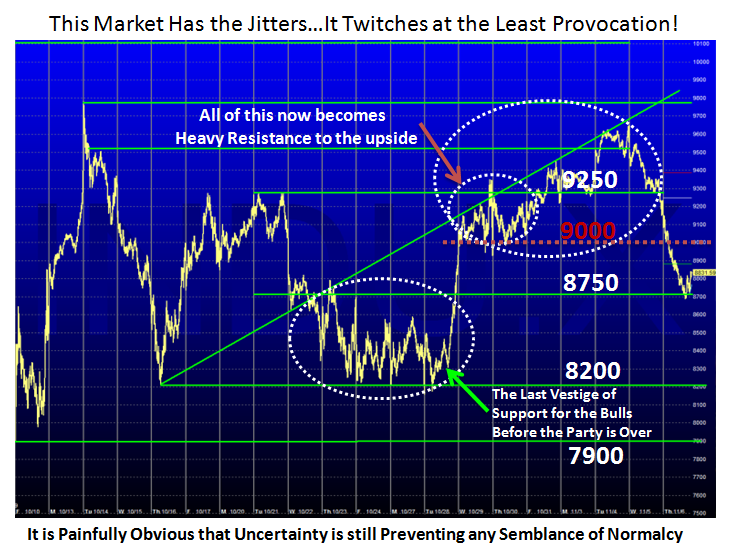 This entry was posted on Thursday, November 6th, 2008 at 4:28 pm	and is filed under HGS Principles, Market Analysis. You can follow any responses to this entry through the RSS 2.0 feed. Both comments and pings are currently closed.